There are a few components to this year elections on Nov 4th. The first is US Senate, House of Representatives (Think how much Pallone has helped Highlands since Sandy) & Monmouth County Freeholder. 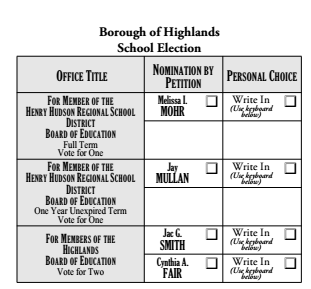 The second piece voters choose members on the Highlands School boards. You have two seats available at the Henry Hudson District and the Highlands Board of Education, (Basically the elementary school district. The last are public questions. One of which is at the local Highlands level. The first public question asks if voters approve amending the Constitution to allow a court to order pretrial detention of a person in a criminal case, changing the current constitutional right to bail. 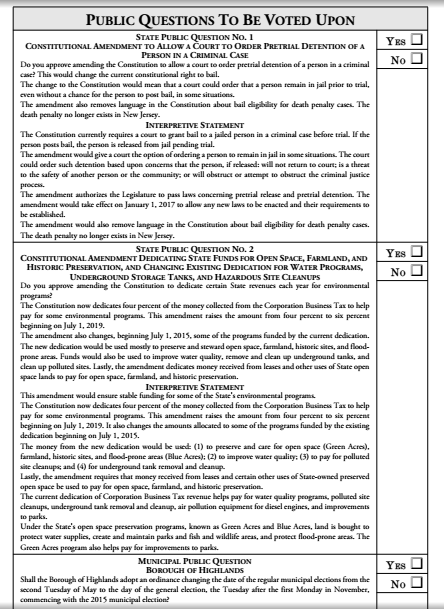 The second public question asks if voters approve amending the Constitution to dedicate certain State revenues each year for environmental programs. The third public questions asks Highlands voters if the local non-partisan elections (council and mayor positions) should be in May 2015 or November 2015. Normally, non-partisan elections are held in May instead of November. There is an opportunity to move it back to November and have it aligned with the normal election date. The down side to that would be the current incumbents would keep their seats for the extra time without being challenged. Like many others, I was all about saving the town money. It made sense to move the election back to November. The May election costs approximately $7,000. But after the recent time and money waste that is R-14-220 (https://highlandsblog.me/2014/10/20/new-disclaimer-proposed-for-highlands-residents-on-facebook/) it’s evident that we need the opportunity to elect new council members ASAP. I’ll be voting “no” on November 4th. I’m voting NO to November as well. Let’s embrace the intention of NON-PARTISAN for a couple of election cycles before throwing it all back into mainstream politics. Statutes recognize a 3 year period before a governing body can change the May election cycle without the need of a referendum. I’m sure that timeline holds some meaning and purpose behind it. We need a change and we need it NOW!